Hands up if you know what a Scottish wildcat is? Most of us know a fair bit about the problems facing polar bears, gorillas and tigers. But what about our very own native cat– Britain’s own tiger – the Highland Tiger? Now there’s an animal in serious trouble. To find out why, we need to go back a few thousand years. Wildcats colonised Britain after the Ice Age, over 9000 years ago, when there was still a land bridge to the Continent. They are therefore, one of our ‘native’ cats along with the long-extinct lynx. Wildcats then followed the spread of suitable habitat and prey so that by the time Britain became an island, they occurred over its length and breadth. During their millennia of isolation, ‘our’ wildcats evolved to become what many consider to be a separate subspecies: Felis sylvestris grampia. 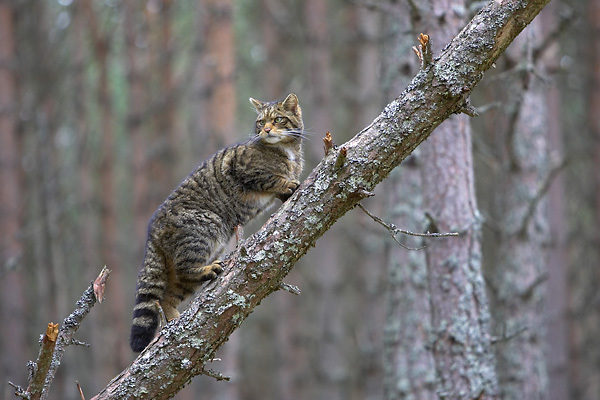 Loss of forest habitat, hunting for their fur and persecution ensured that by the late 19th century, wildcats in Britain were found only in remote parts of the Scottish Highlands and only there in very low numbers. They began to recover after the First World War and spread quickly across northern Scotland but by this time, domestic cats had become widespread and the principal threat that faces wildcats today - that of inter-breeding with domestic cats – began to take hold. So what’s the difference between the two? 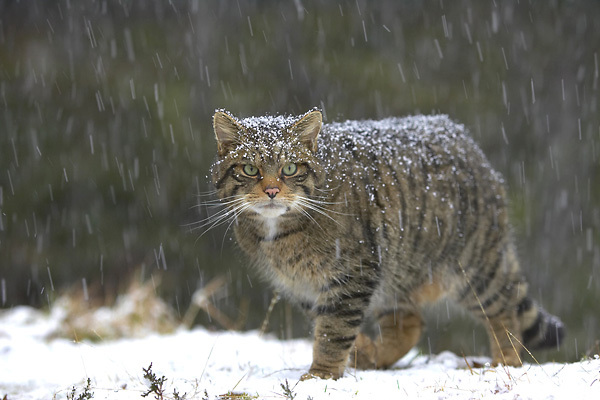 As a subspecies of the European wildcat, the Scottish wildcat is the largest and most powerful of all wildcats, a trait not lost on Highland clans who adopted the animal as a symbol of ferocity and independence. The animal lounging on your sofa however, originated from the smaller African wildcat which, with human help, has spread throughout the world. It is believed that domestic cats have lived alongside humans for over 2000 years in Scotland – but not on the scale that exists today. There are thought to be 9 million domestic cats throughout the British Isles – twice the figure of 30 years ago and a statistic of some significance to wildcat conservationists. Apart from differences in genetics and temperament – wildcats are considered to be untameable – there are visual differences between the two, the most obvious being a distinctive bushy ringed tail with a blunt black tip. So that’s the history done, what’s the situation today? 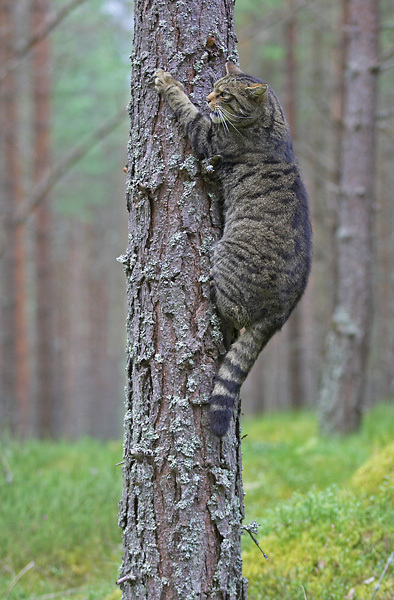 The Scottish wildcat has become extremely rare. It’s much rarer than the Bengal tiger. In fact, experts believe there could be as few as 400 left in the wild. Yes, just 400! 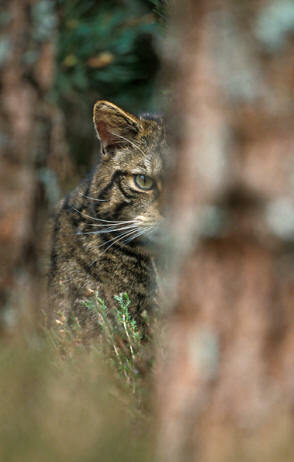 This makes the wildcat probably Britain’s most endangered mammal. Unlike other high-profile species that have benefited from well-funded conservation campaigns, the wildcat has strangely never had an organisation willing to champion its cause. Red squirrels, capercaillie and sea eagles have become the wildlife equivalent of The Beckhams but the wildcat has simply slipped off our radar. Until now. 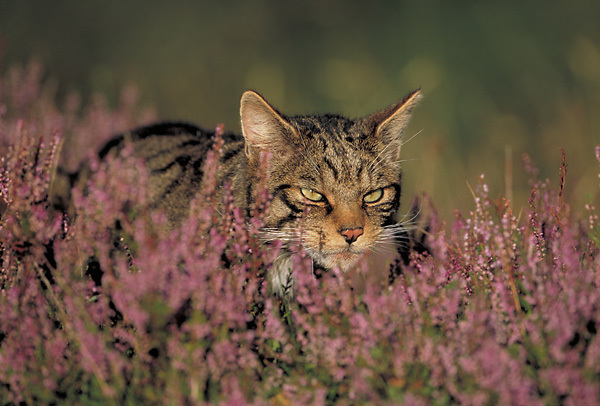 The Cairngorms Wildcat Project, branded as Highland Tiger is a unique initiative to safeguard the Scottish wildcat in the core of its existing range. Through its partner organisations and a long list of wide-ranging supporters, the project hopes to stem the genetic dilution of wildcats and establish a core population from which a long-term future for the Scottish wildcat may be secured. There are practical aspects to the project such as research on distribution, working with land managers to ensure wildcat-friendly predator control and involving local cat welfare groups to encourage responsible cat ownership. As much as anything however, wildcats need a PR makeover; they need to be brought into the public consciousness; people need to find relevance and therefore value in this cultural icon. The wildcat needs people to care about their Highland Tiger. But why bother? Good question! 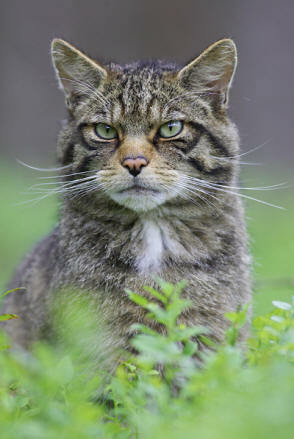 Firstly the Scottish wildcat is Scotland’s only remaining native feline. As a predator, it plays a crucial role in our ecosystems. It is rooted in Scotland’s natural and cultural heritage, an untameable spirit admired by the people of the Highlands for centuries. The wildcat is everything it is to be wild. It is a creature to admire. To safeguard its future would be something we can all be proud of. Letting it slip away is surely not an option. The Highland Tiger needs our help and fast so do spread the word. Tell your family, friends and workmates about wildcats - in fact anyone that will listen and even those that won’t. In fact, especially those that won’t! We can all play our part in saving the forgotten cat. · 400 years ago wildcats were numerous. Today, there are believed to be as few as 400 left. · Many people living in wildcat country go their whole lives without ever seeing one! 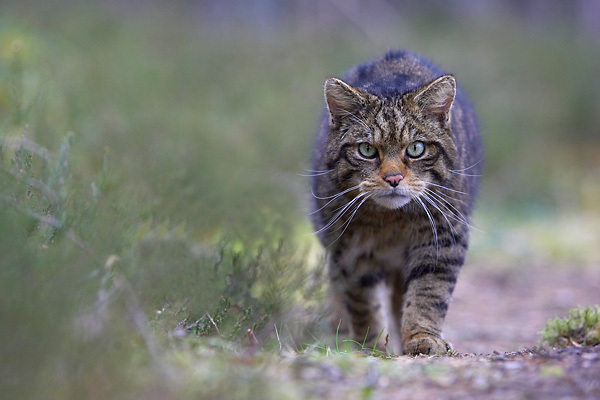 · Scottish Wildcats are real powerhouses - pound for pound they are as powerful as any cat alive. · Wildcat myths claim them to be man-killers hanging from branches by their tails waiting to pounce onto unsuspecting passer’s-by! Alex Hogg - Chairman of the Scottish Gamekeepers Association.